So the whole time, Michael Fassbender wears this giant, papier-mache-style head and mumble-sings gibberish lyrics about things like snags in the carpet while other people play instruments they created out of things like toothbrushes. Welcome to Frank, a movie that is somehow nowhere near as pandemonium-inducingly insane as it sounds. In fact, it’s surprisingly sincere and legitimately sweet for a film that centers on music as an outlet for the mentally unwell. The movie is called Frank, but we start with Jon (Domhnall Gleeson), who is very bad at writing songs. He tries to draw from the world around him, but it turns out “Girl in blue, do you know the girl in red” is not an anthem-inspiring question. As luck would have it, Jon stumbles upon a band that has just lost their keyboard player to a mental institution. They ask him to pay in their gig that night, which he does for all of two minutes before the temperamental Clara (Maggie Gyllenhaal) goes full Johnny Rotten and starts knocking over equipment, ending the show. Jon is enamored with this charismatic lead singer with the giant fake head. When they offer him another chance to join them, he does, no questions asked. Only to discover he should have asked questions. The band semi-abducts him to a cabin so creepy and secluded, Jason Voorhees Realty must have rented it out. Then they stay there for nearly a year, recording an album that makes Arcade Fire sound like Katy Perry. Jon tweets and blogs the whole experience, which gets the band invited to South by Southwest. But when you have a head as big as Frank’s, you don’t have the luxury of having any more success or anxiety crammed in there. Things begin to fall apart, as the movie pivots from an exploration of the artistic process to a symposium on the use of art as therapy. Gleeson is great as the “straight man,” the audience’s surrogate, asking things like “how does he eat?” As the only seemingly sane character, he does a magnificent job showing there’s no difference in the humanity of the “well” and “unwell.” Gyllenhaal is luminous and powerful as Clara, a tempestuous thundercloud shaped as a rocker grrl. But this is Fassbender’s show. Jon Ronson and Peter Straughn’s script is clever, and Lenny Abrahamson’s direction is lithe and appropriately pithy. But Fassbender, stripped of facial expressions (unless he dictates them from beneath his headgear) and kept to a minimal amount of dialogue, uses body language and hand gestures to deliver a complex, nuanced character. By the end, you know Frank. You love Frank. You root for Frank. But most importantly, as a character with authentic mental illness, you understand him. 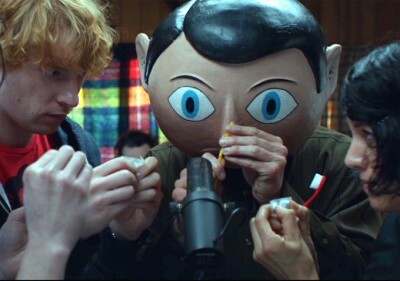 Frank is genuinely odd, not some premeditated indie quirk. Its uniqueness is why it will no doubt struggle to find an audience (hence why it’s in theaters at the same time it is On Demand). But however you find Frank, find him. He’ll be the best weird friend you’ve met in a while.